A Citrus sinensis (L.) Osbeck cultivar. For details of the Sweet Orange see Citrus sinensis ‘Chinese Oval’. The fruits of the Navel Orange are characterised by the possession of a navel-like, protuberance at the opposite end from the stem. This is in reality an underdeveloped conjoined twin. Navel Oranges are sterile and seedless. The Navel Orange occurred as a bud-sport of a variety of the Sweet Orange in a monastery in Brazil in 1820. The Navel Orange evidently appeared in Australia within a few years of its discovery in Brazil, and was reportedly grown in Sydney by 1828. ‘The Navel (syn. Bahia) stands prominently to the forefront amongst our choicest oranges. Imported from Bahia, Brazil, into the United States, it has been distributed to every part of the world offering suitable climateric [sic] conditions to its successful cultivation. The blossoms of navel oranges are double, having a secondary blossom within and no pollen. When an occasional seed is found in them it is the result of transported pollen. 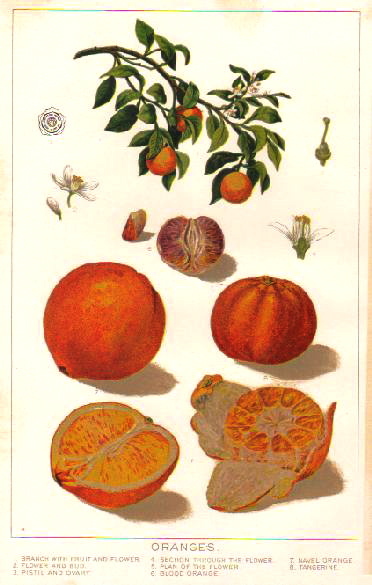 Few citrus varieties sport more readily than does the Navel, and we have now in cultivation a number of these oranges, which differ materially from one another as regards appearance and time of ripening.’ [Despeissis p.236/1903]. Listed in all published catalogues as ‘Bahia or Navel Orange’ [Orange Tribe no.1/1843]. In a letter to James Graham of Melbourne, 30th June 1845, Macarthur describes the Navel orange as originating in Brazil. The first record of a ‘Brazilian Bahia Orange’ is from the Sydney Botanic Garden in 1828, the plants imported from Brazil. Macarthur’s Bahia may have come from the Sydney garden or have been collected in Rio de Janeiro on Macarthur’s behalf. Citrus sinensis ‘Navel Orange’ | source unknown. the Navel Orange is shown at bottom left both entire and sectioned to show the conjoined twin.